The Evolution of our products. Notes on Innovation & product development. two full time adults & several part time employees. products that would respond to some of the needs we had identified in our professional lives. Our aim was to manufacture products that were useful to the Australian outdoor experience & that were entirely made in Australia from Australian materials. Whilst many manufacturers were responding to the lure of the Orient we believed there was a market for top quality manufacturing that lasted longer than a couple of weeks. 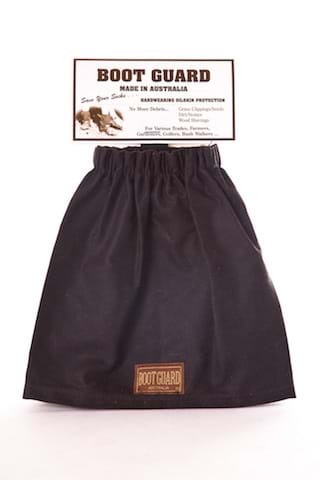 We began by making our flagship product ,Boot Guard in our garage, with a Singer sewing machine & then taking the product to market to test the water & get some feed back. Our first outings in Spring were to Farm & garden Shows which provided invaluable reactions, insights and ideas for further useful products. By Christmas we had a short list of ideas that we were going to design and manufacture based on this experience.We came back from our annual Christmas camping trip to the high country to find our fax machine with a trail of orders snaking across the floor & and the answerphone full of enquiries.The nucleus of business was born. retailers. We also manufacture Boot Guard as promotional item for the corporate world & for a range of smaller companies. before investing time & money to bring them to market. and improving the quality of life. There is always a better way. We believe in Australian manufacturing & try to reflect all the best qualities of this great county in our products and marketing. Next, we will consider the garden and its merits. Garden Design & Adding Value to life & land.. There are two consistent reactions to the domestic garden. One , that it is a chore,a problem,something to be tolerated. Two that it is loved with passion & imagination. What precipitates this division in opinion & where do you stand in the relationship with your garden. Is your relationship with the garden one of visual pleasure or one of pragmatic production. Historically the garden was essential to existence for most people and was used to produce food and supplement income.Much of the working population were engaged in agricultural industries and would keep a garden as means of survival. .There are still communities around the world who depend upon a garden to survive and the lines between commercial food production and a domestic plot are blurred as both are essential. With the advent of the industrial revolution many agricultural workers migrated to new cities and within a generation food production was mechanised and any connection with the land lost. Industrial cities had little space for kitchen gardens & the division of labour meant that it was easier to buy food rather than produce it. The ornamental garden was the preserve of the spiritual and landed elite and existed outside the reach and consciousness of the majority. In Japan the stylised garden emerged in the seventh century and evolved over the centuries patronised by the nobility as an expression of enlightenment & religious devotion. Japan was closed off to the rest of the world by culture and distance. In Mesopotamia ( The Middle East) and Egypt the ornamental garden can be traced back 3500 years and once again were accessible both emotionally & practically only to the ruling class. As the world began to open up through exploration and commerce, ideas of the ornamental garden or pleasure garden began to permeate the European consciousness. and success in shaping nature to his own ends. The garden became a source of pleasure and status. This brief and potted history of the evolution of the garden gives some insight as why we may consider our own gardens the way we do. In our own personal natured and nurtured experience we can find clues about our attitudes and approach to the garden. Utility and pragmatism, dreamy conceptualism, scientific laboratory or no consideration of the garden at all. In todays world the garden has entered the collective consciousness like never before. The gardens value lies not only in its ability to feed us but also as a responsive connection to our distant pasts and as way of adding monetary value to our homes and sensory enhancement to our lives. Flower and vegetable varieties from around the world are available for us to grow or admire & all the time new cultivars are being developed and introduced, the choice is almost endless. The design of our garden can reflect just about any culture from the Zen simplicity of rocks and raked gravel, the organised chaos of herbaceous borders, the formality of hedging and lawns, the imitation of nature or a mixture of herbs in a window box. In the city we can find parks,courtyards,rooftops,balconies & streets all subject to some form of gardening, in the suburbs garden styles are many and varied and out into the country where the paddocks,fields, woodlands & grasslands all offer clues that we can use to enrich our lives. On The Road in Australia..........Shows, Fairs, Expos from Rocky to Freo. One way to publicise a business is to advertise in hard copy publications, another to engage the nebulous digital environment. Results for both of these methods are not easy to quantify. Our chosen advertising & marketing method has been to hit the bitumen and take ourselves to the people rather than expecting the people to come to us. The results are instant, sometimes searingly honest, sometimes astonishingly kind but always interesting & valuable. We begin at The Carlton Gardens in Melbourne where is it 42 degrees, otherwise gentle people are flushed & fraying, water restrictions have just been announced & we are selling The Flying Helicopter Sprinkler. excellent sales in Europe, UK and USA and on our first day , in the heat and creeping drought we recorded excellent sales and gave everybody a good laugh with a our whimsical display. From the Carlton Gardens we travelled all over south east Australia, to garden shows, agricultural shows,field days and expos. We quickly sold out of our first consignment of sprinklers, we also met a whole host of interesting people, both fellow exhibitors and customers, all of whom had valuable information to dispense. land restocked. Water restrictions were introduced and sprinklers were banned, overnight our adventure was over and we could no longer sell the flying Helicopter Sprinkler. some of Victorias water storages were down to 15 per cent and advocates of climate change were clamouring, labelling the big dry as the new normal, the new climate with significantly less rain, just as modelling had suggested. The Helicopter Sprinkler Display and stock were packed up and stored in the shed never re emerge again. The drought lasted for 13 years , artificial grass became very popular and succulent gardens replaced flower borders. in the meantime we had developed our range of protective wear for farmers, gardeners and bushwalkers and had been back out on the road again to test the market, make some sales, listen to customers and act on the information. The range of products now listed on our website reflects this experience and are always refining , improving, innovating and adding to our range. We have just come back from the Royal Adelaide Show where we have a great following now and have recorded some excellent sales and great feedback. We also have ideas for a new range of protective wear. Ironically as we drove home through farm land bursting with ripening and abundant crops rain began to fall, lightly at first and then gaining in volume to the point where driving became dangerous. We stopped for the night, took a motel room and watched the news for the first time in 2 weeks. A biblical flood was soaking the country,riverbanks collapsing, dams overflowing and tanks filling. The drought is well and truly over for now although the Flying Helicopter Sprinkler is still in the shed. Everything changes. Masses of gardening books are published every year, some go on to be classics and required reading. Over 200 years of garden publishing will be discussed and a short list of books considered as valuable additions to professional and amateur bookshelves........but which books are they ?